Jaipur, 4 March: Avant-garde film maker, Mani Kaul stressed on the importance of every single body part of an actor. He also made the actors conscious of the frame in terms of the occupied and unoccupied area. This was stated today by renowned Indian film and theatre actress Mita Vashisht who has worked closely with Mani Kaul in several films like Siddheshwari and Idiot. The actress was in conversation with the curator of ‘तह-सतह: A Very Deep Surface’,Ashish Rajadhyaksha on ‘That thing called actor…’ taken from her under-production film First Take Ok on Mani Kaul’s theory of performance, the actor/director and key figure in Kaul’s Siddheshwari and Idiot. 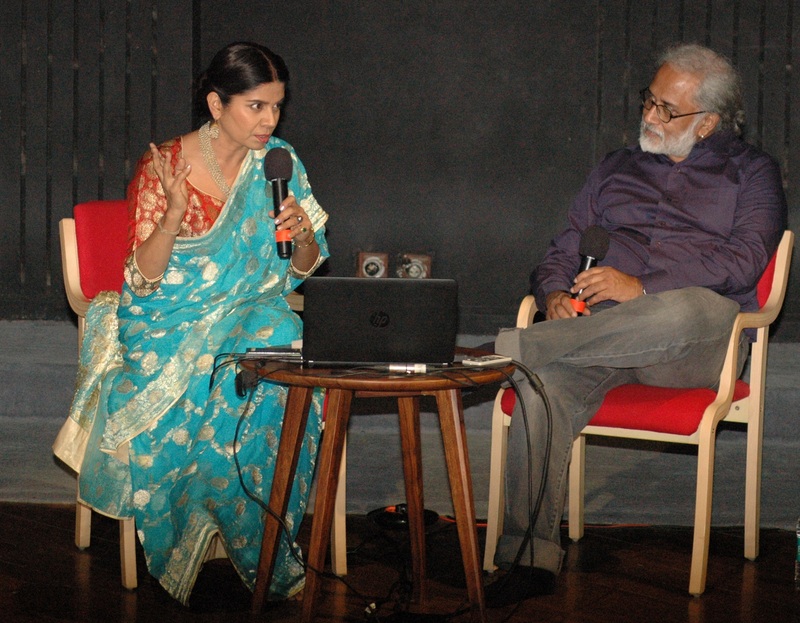 Mita Vashisht reflected upon her iconic work in films with Mani Kaul. She said that Mani Kaul was well-known for creating myths. One of his myths was that he didn’t work with trained actors. He believed that trained actors would replicate their cinematic habits in his celluloid films. She differentiated between Nrit, Nritya and Natya with emphasis on stylization of gestures and expressions. As an actor she still considers Siddheshwari to be one of her seminal works. She spoke about how Mani Kaul taught her to place emphasis on her body and develop a better sense of frame. Mani Kaul was extremely involved and alert with the processes of the actor. In fact, he saw the many variations human beings were capable of, said Mita Vashisht. Talking about her experience as the lead actress in Mani Kaul’s Siddheshwari, she said that Mani Kaul did not want her to act like or imitate Siddheshwari. Rather he wanted her to present the singer. To represent her perfectly, Vashisht looked closely at Siddheshwari’s pictures from different ages. She also studied miniature paintings in detail to understand postures and how to motivate her senses during a scene.